My Tessel 2 Microcontroller which I will be using for this demo! If you do not have Node.js installed yet, head over to the Node.js website and download Node.js v4.4.3. If you are installing Node.js for the first time or looking to upgrade it to a newer version, I would recommend installing version 4.4.3 as later versions seem to have a bit of a bug with the Tessel 2 (particularly on Mac OS X). Feel free to try the latest version (chances are it was just my computer) but if you do have issues, try v4.4.3! If you were like me and needed to upgrade Node.js, I did so initially by following this guide from David Walsh. However, it may be neater (and safer) to work with the NVM method if you have got a lot of Node dependencies running on your computer. I also reinstalled different versions with the .pkg download file from the Node.js site and it downgraded and upgraded with no issues. Whatever method you use, aim to install version 4.4.3. ERR! WARNING: No usb controller found on this system. The Tessel has an amber colored LED that represents Wi-Fi connectivity, if you see that blinking, then all is well! A wonderfully convenient feature of the Tessel is the ability to push and run code from your computer to the Tessel over Wi-Fi, so that you do not need to have it connected via USB all the time. This is especially handy for those with many devices or those who have a plan for their Tessel creation that involves placing it in a hard to reach location in the home. INFO Tessel authenticated with public key. INFO Beginning update download. This could take a couple minutes..
INFO Please do not remove power from Tessel. You may need to hit Ctrl + C, to get back to the command line after this… for me, it finished but didn’t end the program. If that happens to you, Ctrl + C shall fix it! Our Tessel should be completely ready for a test app. Let’s make our Tessel flash colors like crazy. // Turn one of the LEDs on to start. If you run that, you’ll see two of the LEDs on your Tessel blinking back and forth. That’s an exciting first step but I prefer to ramp things up a bit. Let’s blink all four LEDs and blink them a bit more rapidly. The Tessel 2 has four onboard LEDs — ERR (red), WLAN (amber), LED0 (green) and LED1 (blue). 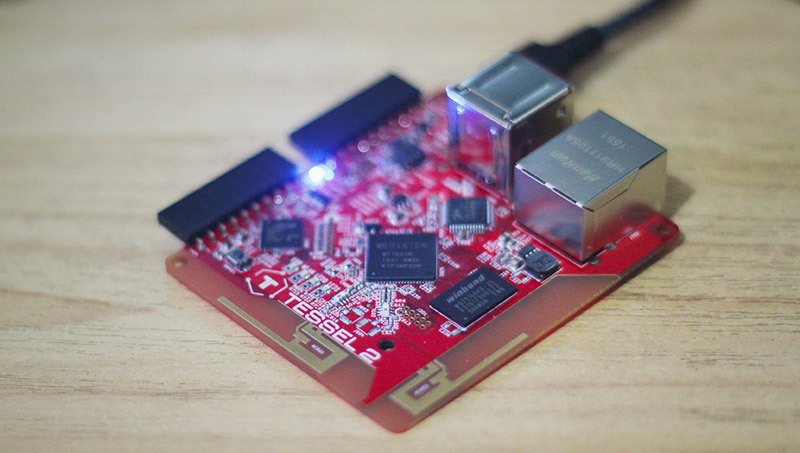 You will see all four lined up beside each other just above the “Tessel 2” logo and text on the board. For real world apps, chances are low that you will want to be taking over the ERR and WLAN LEDs. For a fun little test app though — I say why not! This order matches the order they appear on the Tessel board itself. In the code above, we switch on both the ERR and LED0 LEDs to start with. Then, every 80 milliseconds, we toggle all four LED states, which makes them blink in an alternating pattern — first the ERR and LED0 blink on and then the WLAN and LED1 LEDs blink. They continue doing this forever, until you press CTRL + C! That completes the basics of getting started with a Tessel 2 microcontroller. In the next article in this series on Tessel, we will look at setting up a Tessel GPS module and how to retrieve location data from it! If you have a Tessel 2 and have built something fun with it, I’d love to hear what you’ve built! Let me know in the comments below, or get in touch with me on Twitter at @thatpatrickguy. PatCat is the founder of Dev Diner, a site that explores developing for emerging tech such as virtual and augmented reality, the Internet of Things, artificial intelligence and wearables. He is a SitePoint contributing editor for emerging tech, an instructor at SitePoint Premium and O'Reilly, a Meta Pioneer and freelance developer who loves every opportunity to tinker with something new in a tech demo.